The food that we eat is often taken for granted, without thinking of the farmers' efforts to grow, tend, and harvest the crops, as well as the farmers' financial responsibilities. Farmers Edge™, a company dealing in decision agriculture released a comprehensive R&D roadmap outlining its product enhancement and innovation plans through to 2019. Now processing over 50,000 fields a day and analyzing over 11 billion data records, Farmers Edge provides unbiased insights to help growers base farm management decisions on data, not marketing campaigns, traditional practices, or gut instincts. On the heels of introducing 19 new tools this year, Farmers Edge will release over 90 additional ground-breaking digital agronomic tools to enable data-driven decision making and support high-yield crop production. 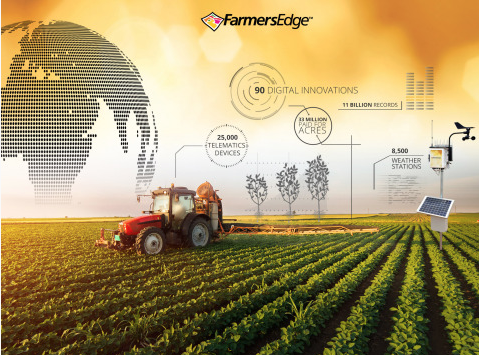 Now processing over 50,000 fields a day and analyzing over 11 billion data records, Farmers Edge provides unbiased insights to help growers base farm management decisions on data, not marketing campaigns, traditional practices, or gut instincts. Wade Barnes, president & CEO of Farmers Edge remarked that the ability to gather and integrate detailed information from growers’ fields, coupled with advances in weather forecasting, rapid processing, predictive modeling, and machine learning, is changing farming from a business that often reacts to the past to one that uses data to support decisions for seasons ahead. It’s about accuracy, efficiency, productivity, and ease of use. This year, Farmers Edge is forecast to expand their data collection network to encompass over 8,500 weather stations and 25,000 telematics devices across 33 million paid product acres. That growth fuels the development of more tools to let growers experience the value of their farm data and show them how it can be used to save time, stay organized, and make more money. This isn’t just the beginning of decision agriculture, this is a digital disruption.